With so much going on in London this evening we almost forgot to mention that Kid Acne has a show also opening this evening but in Newcastle Upon Tyne at Electrik Sheep Store & Gallery. 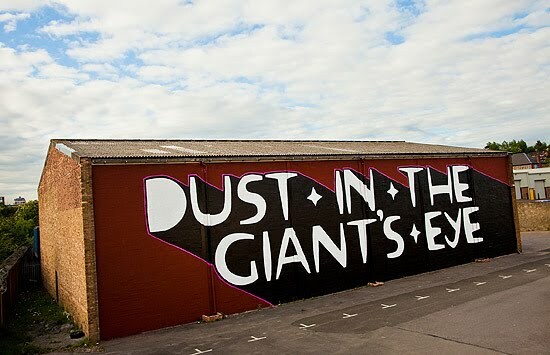 Dust In The Giant's Eye - is his inaugural show in the North East. Kid Acne began writing graffiti as a boy, inspired by its infinite scale, colour and immediacy. Applying the same DIY ethos to the rest of his output, he spent his teenage years creating underground fanzines, comics and releasing limited run 7" and Lp's on his own Invisible Spies imprint. His work as a grown-up has been seen throughout the world, in exhibitions from Helsinki to Melbourne and in weekend rap-sprays from New York to Azerbaijan. Tonight 1 July sees him with new works at the Electrik Sheep gallery space, if you are in the area don't miss it.